Arena Tournament Play, Foil Cards, and United Heroes Added to the Star Realms App!!! 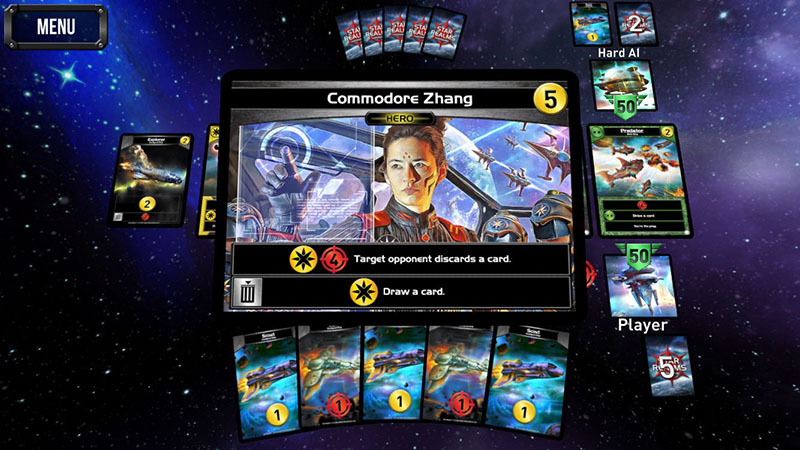 I am incredibly excited about our new Star Realms digital app update! It includes the United Heroes expansion and the all-new Star Realms Arena with in-app tournaments! United Heroes is a $2 expansion with a new campaign chapter and 8 new Heroes for your Trade Deck. More powerful than the heroes from the Crisis set, these cards generate big effects and trigger unused ally abilities of their faction TWICE: once when you acquire them and again when you sacrifice them. In the Star Realms app, you can click on the “Store” button to purchase and play with this new expansion now! While United Heroes is an awesome addition to the app, the Star Realms Arena is even cooler! Everyone has access to Arena, whether you buy United Heroes or not. 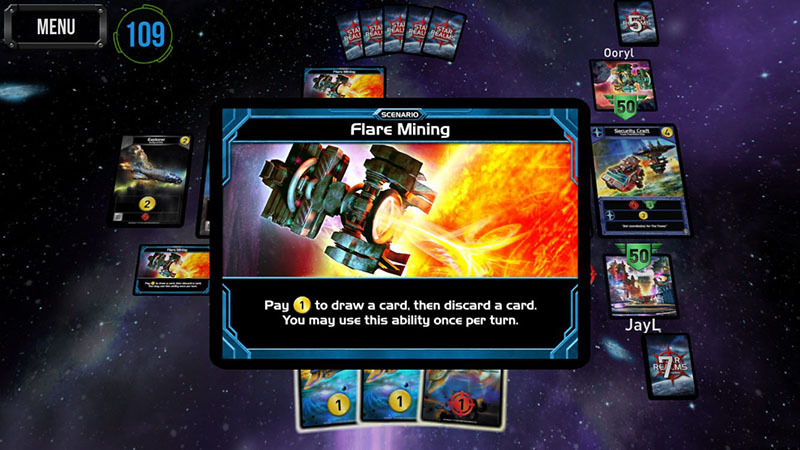 Star Realms Arena is a weekly tournament format with trophy stars and foil cards as prizes. 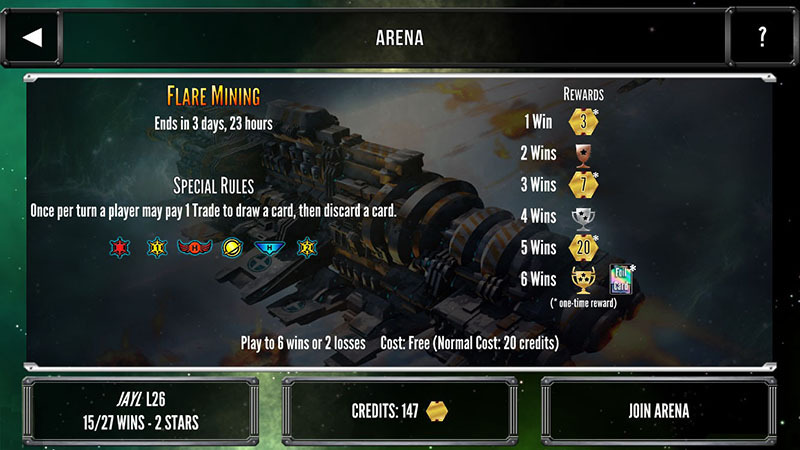 If you want to play in Arena, you need to download the Star Realms update, then go to the Play Online lobby and click on the Arena symbol in the top right-hand corner. Each week, there will be a different tournament format, and you can win prizes based on how many games you win. Once you join an Arena, you may play until you reach 6 wins, or 2 losses, whichever comes first. All Arena games will be real-time, but we’ve added extra time to the clock so you won’t feel too rushed. Arena will feature a new format each week with its own special rules. Often these formats will be from the Scenarios set. For example, one week Arena may be Flare Mining, which allows each player to pay 1 trade to draw a card, then discard a card, once per turn. The next week’s format might be Rushed Defenses which puts bases directly into play when acquired and scraps them when destroyed. Arena also uses specific sets each week, however players will be able to play Arena using those sets even if they don’t own those sets! Arena prizes are awarded based on the number of games you win. Some prizes are available in every Arena tournament (like Trophy Stars). Other prizes are only available once per week (like Credits or weekly Foil Cards) or once per season (like Season Avatars or Season Foil Cards). 2 1 Star Trophy. Season Foil Card**. 6 3 Star Trophies. Foil Card*. * Awarded once per week. ** Awarded once per season (typically there are 4 weeks per season). Trophy Stars are a way to track how well you have done in Arenas. Each time you finish an Arena, may can win a trophy with 1, 2 or 3 stars based on the number of games you won. Your Trophy Stars will be displayed next to your level, and top winners will be displayed on weekly, monthly, and yearly leaderboards. After your free entry each week, you may join additional Arena tournaments using credits. Each week’s credit prizes are one-time rewards. After you win all the credits that an Arena week has to offer, you’ll have to wait until the next week to win more. Each Arena Season (typically there are 4 weeks per season) will have an Avatar reward that can only be earned that season. Season Avatars are one-time rewards, so you can’t win multiple Avatars in the same season. Foil cards are premium cards with a foil finish making them look shiny. They also feature minor animation that suggests motion. Whether a card is foil or not has no effect on gameplay. Foils just look cool. If you own a Foil Card, whenever you acquire that card during regular gameplay, both in and outside of Arena, it will turn into a foil. Both you and your opponent will see it as a Foil Card once you acquire it. You only need one copy of a Foil Card and then every version of that card you acquire in games will appear as a Foil Card. You may only win one copy of each weekly and seasonal Foil Card (because you only need one). The first 100 players to reach 100 Trophy Stars will receive the Brain World avatar in the app! This has been one of the most requested avatars, so let the games begin! You don’t have to pay anything extra to gain access to Arena, it is a free feature that comes with the full version of Star Realms. Your first Arena tournament each week will be FREE. After you reach 6 wins or 2 losses, you may join again for 20 Credits. You can win credits in Arena or you can buy credits as an in-app purchase (80 credits cost 99 US cents). Don’t worry, we aren’t taking any features away. Traditional Star Realms matches are still free, unlimited, and completely separate from Arena. Arena is just a cool extra.